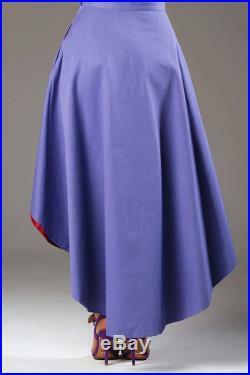 Lilac denim asymmetric skirts with lining and pockets for hiding a lipstick. On salewas 115eur and now 80.50eurmaterial. Shell: 100% cottonlining: 100% viscosesize s :waist - 70 cm / 27,6 infront length - 47,5 cm / 18,8 inback length - 102, 5 cm / 40,5 inwe are open to custom orders; all our designs can be custom-made and adjusted according to the preferences and measurements of the client to ensure an impeccable fit and a flattering design.